3rd year Pic 264 - Jun 28 2011 Up Periscope! Indian Cormorant (Phalacrocorax fuscicollis) at Khem Vilas Cormorants and shags are medium-to-large seabirds. 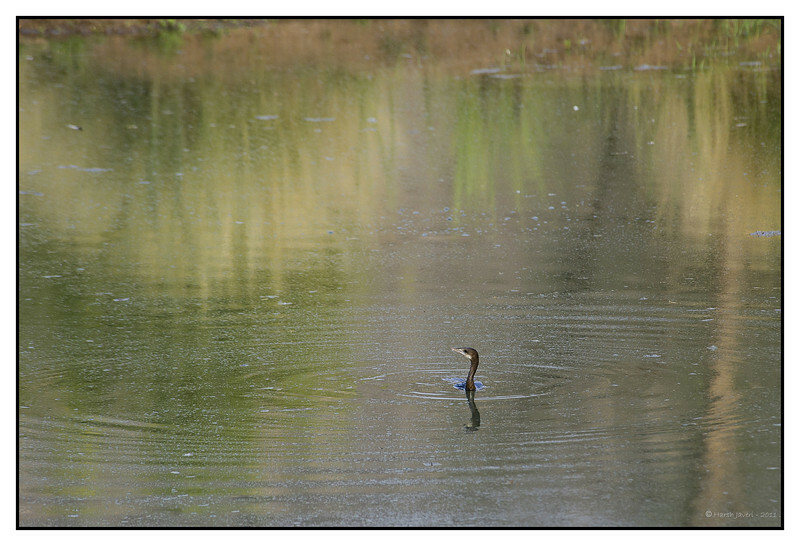 They are fish-eaters, dining on small eels, fish, and even water snakes. After fishing, cormorants go ashore, and are frequently seen holding their wings out in the sun. All cormorants have preen gland secretions that are used ostensibly to keep the feathers waterproof. This is great...love your title. They have the most beautiful feather detail that looks like they have scales. Beautiful stillness & tones to the water. Great capture. Nice, I like the subtle refection. Well done, a very nice image. I've heard that birds evolved from fish, that scales became feathers, this makes me think that may be correct. Excellent capture!